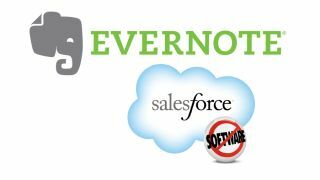 Evernote is among the most popular services in the cloud-based, note-taking arena, and now the company is looking to ramp up adoption of its business version by offering integration with Salesforce.com's customer relationship management (CRM) platform. Evernote Business, which was introduced in August 2012, extends beyond the consumer version by helping organisations collaborate on notes and share notebooks. Thanks to a new Evernote for Salesforce app on Salesforce.com's AppExchange marketplace, users can now add add sales information, customer research, contacts, meeting notes and email exchanges stored in Evernote Business directly to customer records in a single click. The idea is that sales and support teams can access content faster to be more productive, but there's a second advantage. Because Evernote Business works on a mobile or desktop PC while offline, Evernote says that sales teams can use the new app to input customer and lead information in the absence of a connection before syncing it back to Salesforce records once online. Other features include functionality for attaching audio, images and files to customer records from in Salesforce, the ability to view relevant notes from departments automatically, and the ability to build a historical archive of company accounts. Evernote for Salesforce is available now at a cost of £8 (US$13) per user per month. Has Evernote really moved into the world of socks?